And, that is exactly what “AMA” demonstrates as she visits anchorages, ports and people each summer in the Inside Passage. Her design is a study in integration, focused on protecting clean water, people and wildlife. And that super-effective green marine device - as noted by the T. Buck Suzuki Foundation - a light touch on the throttle. Captain Peter Wilcox, Founding Director, is a USCG licensed Master Mariner, author, boatbuilder, economist, architect and longtime renewable energy user and advocate. Peter is both a SAGE and Cascadia Fellow, and was named a Canadian Coastal Champion in 2017. Peter was the president of Columbia Riverkeeper for four years and served on its board for 12 years. He has voyaged the NW’s Inside Passage and other saltwater in handbuilt kayaks and sailboats since the mid-1960's. Peter’s 11-year old vessel, a 36’ motorsailer named Ama Natura (“She Loves Nature”). AMA is based on a sailing salmon troller on which Peter crewed briefly in SE Alaska. AMA was built for him and his wife, Bridget, by the NW School of Wooden Boatbuilding located on Port Townsend Bay, Washington. An introductory ecology course, during Peter's first year of college, set the direction for Peter's life work, including the design of dozens of highly-efficient and solar buildings, clean water protection and clean energy leadership, co-designing two green boat prototypes, and helping to launch Oregon-based SeQuential Biofuels, which in 2018 will make approximately 12 million gallons of 100% waste-sourced biodiesel. In 2016 first Peter proposed the Inside Passage Decarbonization Project to tribes/bands, fuel dealers, ports, fishermen/women and commercial and recreational boaters from Washington to Alaska, throughout the Inside Passage. 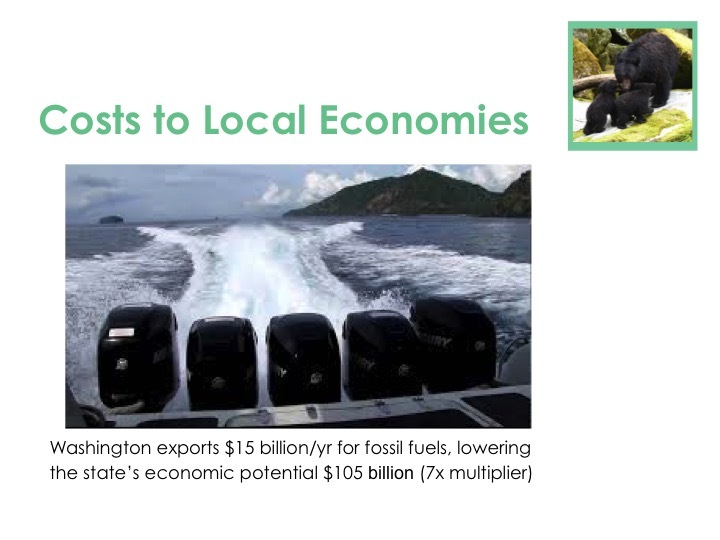 The goals of the IPDP are to make it easy for boaters who want to voyage petroleum-free in the Inside Passage, for marine dealers to gradually - beginning now - replace high carbon marine fuels with 90% or more locally made, clean and waste-based, job-creating green biofuels and renewable electricity, and for marinas and ports to shift to renewable shore power - all in the next 20 years. Bridget Bayer is the first mate of Ama Natura and the Clean Water Prosperity community development director of the IPDP. She is an author, former restaurateur, and community organizer who helps create vibrant port and urban business districts that support local economies and local renewable energy production. She has learned that shared community activities are a catalyst for change. Bridget is a committed ecological practitioner, who hates waste and dependably finds ways to either eliminate or recycle the carbon in it. This is the slide show we present to raise awareness of the Inside Passge climate challenges and how individual and community action can make a positive and lasting impact. Just click the image to advance to the next slide. A Southeast Alaska fishermen's/fisherwomen's co-op that wants to protect and clean the ocean where its members fish and thereby enhance its taste and safety, while receiving a deserved premium for the better quality fish that they can then provide to their customers. A British Columbia marine resort with a very busy fuel dock that responsibly plans to start by switching its own fleet to clean fuels, do their own testing and, if satisfied, then begin selling Bio- and Renewable Diesel to its customers afterwards..
A British Columbia First Nation tribe with a fuel dock that has opposed oil tankers in the Inside Passage, along with many First Nation and other residents, and is considering whether "Boating their Talk" will include clean, renewable fuels. Four or five Inside Passage marine fuel dealers who, when interviewed by Capt. Wilcox beginning in 2016, confidentially shared their strong interest in providing clean, waste-sourced fuel as soon as possible. A substantial number of NW boaters - commercial and recreational - are realizing the benefits and economies of green fuels. Some have calculated the value on their own, others have attended Peter's green boating workshops at yacht clubs or boat festivals over the last couple of decades, and some have encountered Ama Natura somewhere along the Inside Passage in the last decade and saw the benefits for themselves. Start now to “decarbonize the passage” one boat, one fuel station, one port, and one state, province or tribal government at a time. Our children, and future generations of people and wildlife depend on all of us taking action sooner than later. Having local, provincial, and tribal and federal governments develop supportive policies and incentives will likely be necessary to sustain and accelerate this citizen and boater-led grass root effort. Educate and support marine fuel station owners and ports without existing marine fueling infrastructure on how to add green biofuel pumps and renewable shore power - so that any boater who wants to voyage the Inside Passage carbon-free is able to so using easily available waste-sourced biofuels or renewable electricity that best suits their vessel’s propulsion. Encourage and support the development of local, appropriately-scaled and waste-sourced green biofuels and utility-scale tidal, solar, wind and - where essentially harmless to salmon - hydro-produced electricity made available at marinas along the WA, BC and SE Alaska coasts. Since the beginning of 2019, the IPDP has been a registered 501c3 non-profit organization. The bulk of the IPDP’s funding to date has come from Capt. Wilcox and Mate Bayer. Now that the IPDP has its 501c3 NGO status, the IPDP will begin seeking grant funding for detailed planning, summer interns, carbon and other baseline studies, etc. We welcome donations (now tax deductible in the US) - at the bottom of the Home and Start Decarb'ing pages. These will be used exclusively to help offset the costs of the website, marina charges, Renewable and diesel fuel and biolubricants, presentation and workshop expenses, and to fund an annual Solutions Conference held each spring, at a rotating Inside Passage port.